Aleksandriyskaya School is the oldest private school in Ukraine of levels I - III, including primary and secondary school, and providing high standards of teaching, in accordance with the most stringent state requirements. The School also significantly deepens and expands the content of the offered knowledge in all basic and supplementary academic disciplines. Aleksandriyskaya School is a comprehensive full day school. Conceptually the activity of the School is aimed at full and harmonious development of each student, providing individual and graded approach to teaching and educating, ultimate development of each student’s talents and abilities. The School applies the most modern educational technology, perfectly combined with the achievements and experience of home and international education science. The School employs highly qualified professionals, well-known teachers, authors of course and textbooks, as well as talented young staff. The School is partnered with educational institutions in several foreign countries. The School possesses the most up-to-date facilities. All study and rest facilities are provided, including special facilities for the six-year-old first-formers. The standard state certificate of complete secondary education is granted on finishing the School. The School’s activity has been honored with high national and international awards and repeatedly highlighted in educational issues in the press and TV programs. 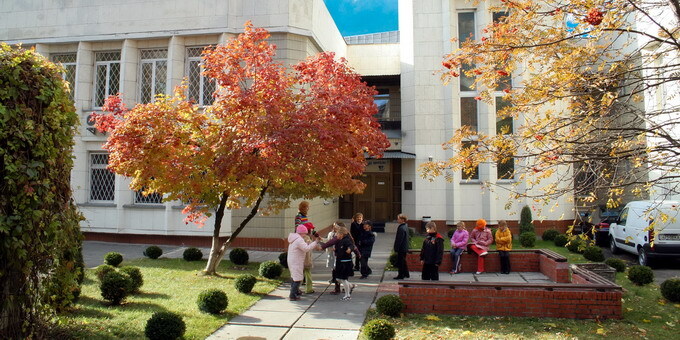 Over the years, Aleksandriyskaya School has been top-rated among the best private schools in Ukraine and Kyiv.